As self-confessed foodies living in East London, we were both guilty of spending somewhat ridiculous amounts of money on nut butters. Whilst peanut butter was more than adequate for heaping onto hot oats or plunging into hungry mouths with unclean fingers, the real favourite was almond butter. Health food blogs and Whole Foods' clever marketing are responsible for the belief that £4 for a small jar of ground down almonds is not only a bargain, but a panacea for all your ills, and if you survey the shelves of the big supermarkets in the last year or so, it's an idea that is catching on. Whilst we have managed to source the soya milk, oats and fresh bananas for our overnight oats, it has been sadly lacking without the salty zing that is provided by a creamy tablespoon of almond butter. Imagine our delight when we discovered a downright delicious alternative manufactured in Antigua, Guatemala – mantequilla de macadamia. Located a short 10 minute bus ride from the market is 'Valhalla', an organic finca de macadamia. 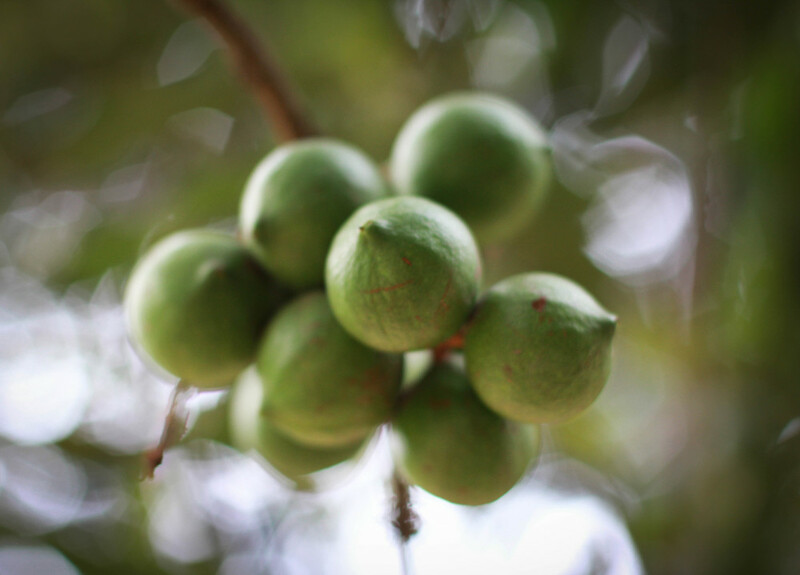 This family run, and operated enterprise, has implemented a sustainable agro-industrial forestry and development programme that, over the last 15 years, has planted 350,000 macadamia trees in Guatemala, for the sole benefit of indigenous communities. It is thought that in this relatively short time, this project has positively influenced thousands of lives, and provided a sustainable living for many, in a country where there is often few options. A short tour provided to anyone who pops by, is concluded with a chance to sample their products and indulge in a complementary facial (donation recommended). The oils and creams, whilst a little expensive, are a delight to a backpackers sun-parched skin and one need only catch a glimpse of the owner's youthful glow to become a convert. For those that would rather taste the goodness, they have a wide-selection of macadamia based treats including dark and milk chocolates, salted and un-salted nuts, and nut butters. Unfortunately we were not able to indulge in the reportedly scrumptious macadamia and berry pancakes in our short visit. The aforementioned ethereal beauty who co-runs the farm recommends applying the butter as a face mask, but we think it goes much better with bananas on toast. At a cost £3.42 a jar, it was a very decadent treat for us. However, when you search on Amazon, you are at least double the price elsewhere. To get to Valhalla, catch a chicken bus near the market for San Miguel Dueñas (leaving around every 30 minutes). Make sure to ask the driver to if he drops off at the Macadamia farm. The trip is about 15-20 minutes and costs Q4 from Antigua. Valhalla is open every day from 8:00 a.m to 4:30 p.m.
want to see more about antigua?